Meet Pepi the cat… He is very special, and not just because he’s so handsome! He came into our lives in late summer, a couple of months after the sudden (and devastating) loss of one of our beloved dogs, Hamish, to a terrible disease. It happened like this. We feed – fed – the local birds on our patio, and one day I realised that the shadow beneath the patio table was darker than usual. Inky black, in fact. As I watched, at the speed of light the shadow detached itself and neatly made a meal of one of the sparrows. I opened the patio door to try to help the poor little thing, but the cat (for such it was) ran off. Over the next few days we played a game that he always won. I’d remove his hiding places, and he would find a new one. The birds, seemingly unaware of the brooding black presence, kept being eaten. I even tried to make the patio cat-proof (no chance!). To cut a long story short, in defence of the birds I started feeding him. (I also moved the bird feeding station down into the garden, close to some bushes where they have more natural protection). Mark decided the cat’s name was Pepi, after an Egyptian pharaoh. Pepi decided to stay. We hadn’t intended to get a cat… We had cats and dogs for years, living happily together, but our last cat passed away at the venerable age of 17 before we got our two setters. Cats just seemed to come into our lives – waifs and strays mainly, which people from the nearby town would dump in the village, thinking that tiny kittens would be fine somewhere rural. (This, by the way, is not true. All pets need proper care). As Hamish and Lexie had not been brought up with cats, they chased them, and we’d never had many in the garden as a result. But when Hamish died, Lexie – who is blind – could no longer help with the cat patrol, so I guess Pepi saw an opening for a stray. But how to care for our new arrival, who clearly doesn’t care much for humans? Food has been the answer so far. He clearly appreciates having his grub presented in a bowl rather than having to catch it. 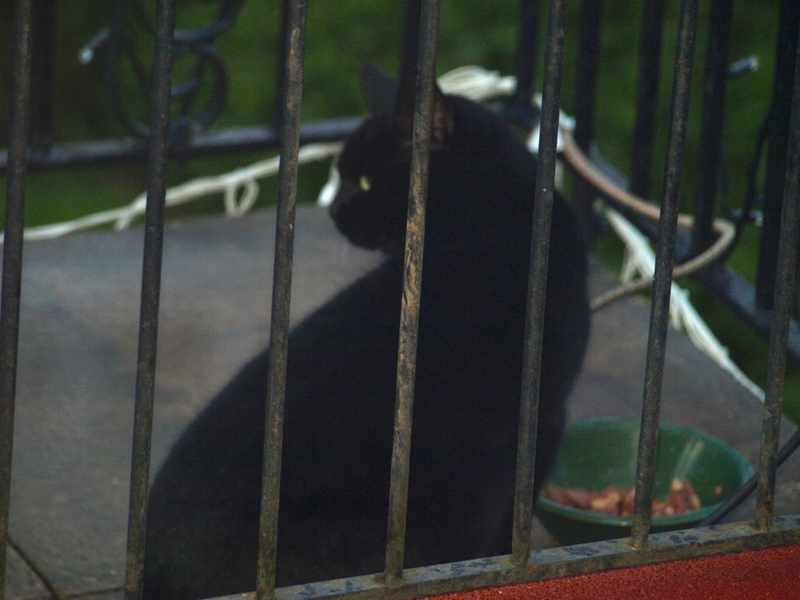 I have to say, we’re not yet sure whether he’s a he or a she because we can’t get close enough to see… He comes running when he hears the little gate open as I go to put his food down, and stands back politely, a couple of feet away. Just far enough. If I try to get closer, he backs off, and he won’t feed until I’m safely back inside with the door locked. This is a photo of him trying the new Purina Pro Plan wet food – Purina have kindly sent me some samples to try. When I realised it was fish, my heart sank because Pepi’s never been fond of fish – I guess because there aren’t many running round the local gardens or farm barns. I had to give a whole pack of a well-known brand of fish-flavoured cat food to our neighbour (to her delight), so I feared the worst. However, about ten seconds after the photo was taken, the plate was licked clean. Success! Pepi has finally been introduced to fish! Going on holiday probably shouldn’t require the same sort of precise planning as a military invasion, but I’m pretty sure that George Bush and Tony Blair didn’t have to put as much thought into Iraq as we did into our holiday last week in mid-Wales. Taking a diabetic dog on holiday requires thinking. Insulin needs to be kept refrigerated, and as our Lexie is Little Miss Fussy, some fresh food, which also requires refrigeration, was needed. This is not to mention the various potions and lotions that her increasingly-aged mom and pop require of course! Then there are the tennis balls for Hamish, the bedcovers (just in case giant setter hoofs somehow land on pristine white bedcovers. We’ve been there, and it’s not pretty). Add to that various leads, poo bags, harnesses, dog dishes, knives (for cutting up said food), plus all the clothes of course, and you have yourself one serious logistical challenge. I was quite proud to find, when we got there, that the only thing I’d forgotten was a washing-up brush. I bet Tony Blair can’t say the same! Goodness only knows what the hotel thought as the staff saw this trail of weird goods going upstairs. Refrigerators, bags of all shapes and sizes and two curious dogs. I don’t think there were any missiles, but I could have put one in by accident, of course. Various dictators have tried to explain this small oversight in court trials over the centuries (I particularly like Ghengis Khan’s immortal quote ‘doesn’t everybody take ten thousand horsemen armed to the teeth on a picnic?’). I have to add, at the end of a week full of sunshine and trips to the beach (and lakes and waterfalls), it’s not the easiest thing we’ve done. Lexie doesn’t eat well on holiday, and diabetic dogs, like diabetic people, have to eat when they have their injections. With people, you stand a chance of explaining this – with a grumpy hot dog who doesn’t want to eat away from home, you don’t. So I ended up pressing good cheese and fresh duck on her reluctant little self. I know there are various people out there who now want to be my pet, details are available on request (haha). Put it this way, she survived – no dreaded hypo, which was a worry with all the extra activity and the heat. 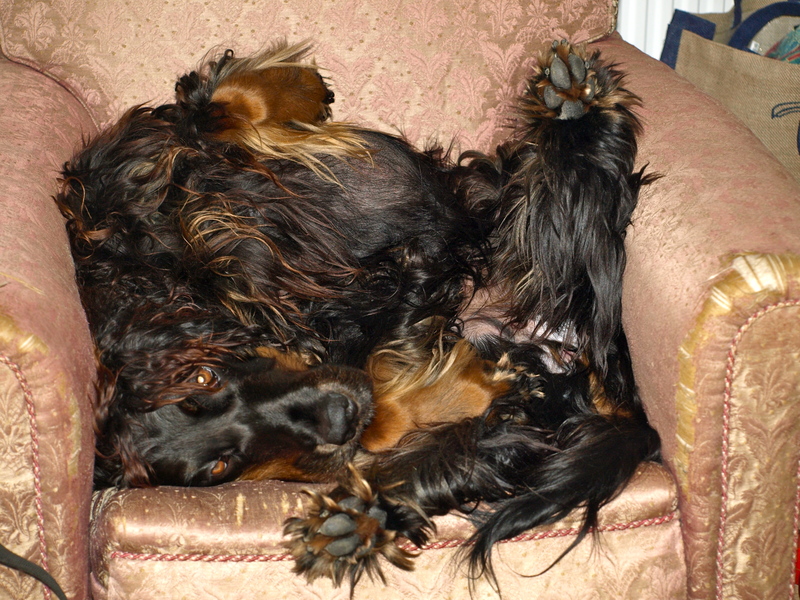 On the Sunday, when we returned, she got a bit wobbly after tearing round the garden to inspect it all in the searing heat, but some glucose and a couple of her favourite chew sticks seemed to do the trick, and today she is back to being Queen Lexie, she of the upside-down snoring regime. 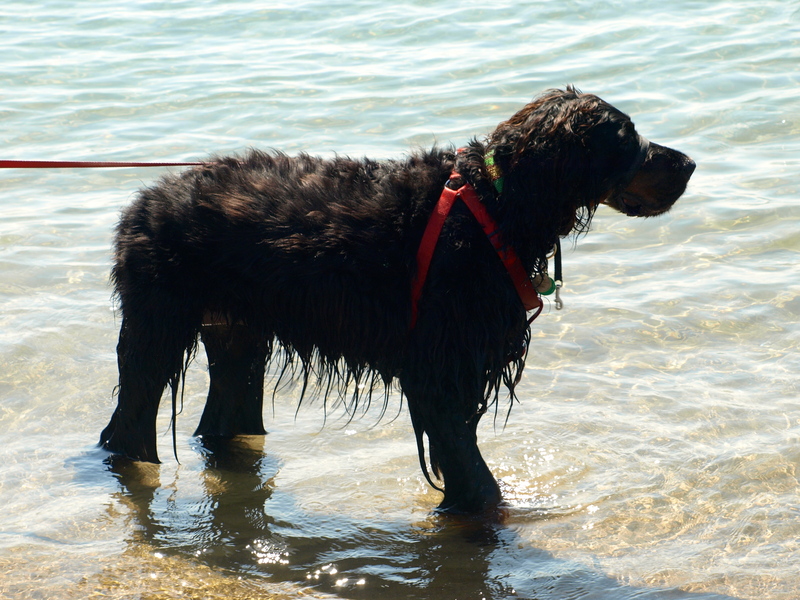 I would love to hear from anyone else who has taken dogs with health problems on holiday, how does everyone manage? Death, as someone once wisely observed, is Nature’s way of getting you to slow down. Some of us, luckily, have no intention of stopping until we actually get to that point, and I was rather pleased to discover I have company during a recent outing to Llanberis. We go there often – the lure of the Cornish pastie is hard to resist! In addition Parc Padarn, beside the Slate Museum, is a great place to walk the dogs. They lollop around, splashing in the many lakes that were carved out of the slate in the days when the area was full of slate workings, and generally having a whale of a time. I, being a granny, am getting to the age where my aches and pains do not help this process (the walking, not the pastie eating. I am still pretty good at eating pasties). Occasionally, while marvelling at the wonders of nature and the energy of the dogs, I find myself wondering if the whole experience would be better if I were, say, 30 years younger. The answer to this wondering came at the end of a walk, when I was taking a well-earned rest near the craft shops. One of the shops is home to a couple of collies and, clever dogs that they are, they had found their own amusement. One in particular was having a wonderful time – it had a ball, which it would place temptingly in front of passers-by, dodging around in a hopeful way. If it had had a big sign with ‘please kick this ball for me’, it couldn’t have been any plainer. I was surprised, though perhaps I shouldn’t be, by the number of people who obliged, giving the ball a quick shove to the dog’s evident delight. Most moved on quickly, as people tend to do, but then the dog had the good luck to meet the lady pictured above. She may not look like the most likely footballer to you, or even me, but to the dog, she was perfect. Indeed, she really was – she began to play ball with the dog with gusto, and before long the pair were having a jolly good kickabout worthy of Pele himself. The dog had all the energy of its youth, but the granny clearly had turbo-boosters on her perseverance, because she kept at it. When I left, with a big smile on my face, she was still having fun with the collie. I realised then – life isn’t about aches and pains, or feeling you must reach point B faster than the person next to you. Life is what you make of it – and in particular, it’s about how much enjoyment you are prepared to gift to others, and yourself. For this insight, I salute a great old lady, one granny to another. Next week, I’m going back to see if I can arrange a rematch.